this software generates a random EQ with a notch or a peak. Your mission, if you accept it, is to find the correction equaliser. gain between -10 and +10dB. In the display, the blue curve is allways the input and for the red line, you can choose between the random EQ (uncorrected) and the random+correction curve. If you get a perfect correction, the blue curve and the red one are merged. The red curve of the display automatically disappears in Normal Mode and comes back when you check your score. Training mode allows you to understand how the soft works. You can show the score while you adjust the correcting EQ and see the red display curve. In Normal mode, you cannnot see the score, if you click on the score button, it shows you result but it ends the test. A new random EQ will then be activated. The score display ranges from 0 to 100. Initial value is 50, when no correction is applied. Under 50, the score is poorer than without any correction ! 100 is given for an ideal correction. It also shows F, Q and gain values of the random EQ. Have a look at this score and random values when you train. Values above 80 are quite good. Note that due to calculation roundings, sometimes you cannot exactly reach 100. Input signal : you can use any wave file or the generator input with pink noise. Personnaly, I found much easier to use pink noise than any other signal. Begin with pink noise as input signal, it’s generally easier. Go to Training Mode, show score and hit New random value a few times while looking at the display. You see the frequency response changing with a notch or a peak, different each time. Also listen to the result and depending on the random curve, you get too much treble or too much bass or a recessed mid, or… So compare to input with the listen buttons. Now try to compensate, the curve with the correction EQ so to have a near flat random+correction curve. When flat, listen to input and after correction, it should sound the same. Have a look at you score, more than 80, there shouldn’t be a big difference listening to input or after correction. Play with different random EQ. 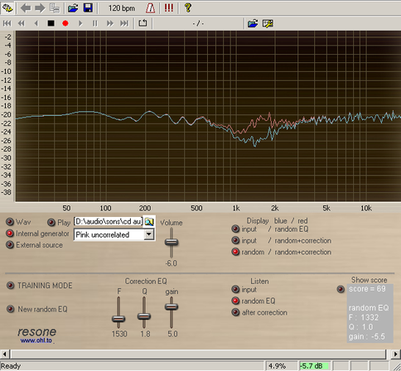 Now you can start the Normal Mode, try to EQ as good as you can and when you are satisfied, have a look at the score. But after hitting this score button, this test is ended, you cannot go back to improve your score, you have to click for a new random curve. Have a look at some other usefull infos about my softwares here : you may find there some help.